Amtrak announced it has extended and expanded its pets program, allowing customers to continue traveling with their small pets on many eastern corridor trains. Amtrak has also added this service for trips up to 7 hours in length to most long distance trains beginning Feb. 16, and is starting a weekend-only pilot program on Acela Express starting, Feb. 20. 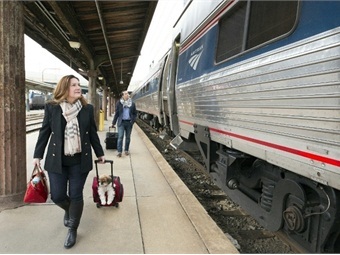 As a result of the success of its pilot test, Amtrak has made its program permanent on eastern and select mid-western corridor trains and expanded the program to its long-distance trains throughout the nation (with the exception of the Auto Train). More than 2,700 pets have traveled with their human companions along the Northeast Corridor since the pilot launched in October 2015. Boston, New York, Philadelphia and Washington, D.C. were the top departure cities. Pet service is available at all stations (staffed and unstaffed). Only one cat or one small dog are allowed in an enclosed carrier on trips up to seven hours in length. Both pet and carrier must be a combined weight of 20 pounds. Advance reservations are required and a surcharge of $25, each way, will be assessed for travel. "We are excited to bring this service to more of our passengers throughout the country who want to travel with these cherished family members," said Amtrak president/CEO Joe Boardman. "We listened to our passengers and delivered on this program, which will also help increase ridership and revenue." Amtrak continues to welcome service animals on board at no charge. For more information about Amtrak's Pet policy, visit Amtrak.com.